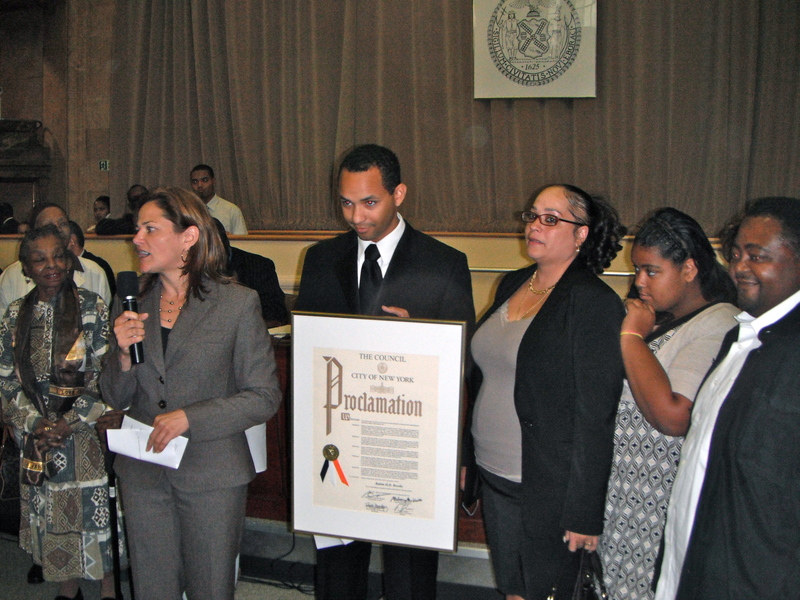 Yesterday, Melissa and the City Council presented a proclamation to Rakim Brooks, a resident of Wagner Houses in East Harlem who is currently a Rhodes Scholar. There are only 32 individuals from the United States selected as Rhodes Scholars each year, making this a highly prestigious honor. Rhodes Scholars receive full funding for up to three years of study at Oxford University in England. Rakim with Melissa and his family. Rakim grew up in East Harlem and attended public schools in the neighborhood. He went on to Brown University and is currently studying at Oxford. The topic of his research is “poverty’s implications for democratic life” and will put a special focus on New York’s 15th Congressional District (which includes East and Central Harlem, parts of the Upper West Side, Washington Heights, Inwood and Morningside Heights). His long term goals are to develop a vision and plan for fighting poverty and unemployment in Harlem and the South Bronx so that these two parts of the city can serve as models for poverty alleviation throughout the country.